Nine Alternaria species have been reported to be associated with sunflower leaf blight worldwide, and A. helianthi has been recognized as the most prevalent and damaging species. 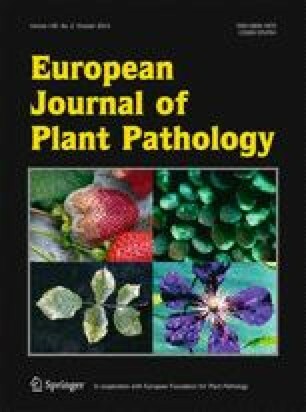 However, the population structure of Alternaria species causing leaf blight of sunflower in China had not been examined thoroughly prior to this study. During 2010 to 2013, a total of 272 Alternaria isolates were obtained from infected sunflower leaves in 11 provinces, autonomous regions, and municipalities of China. Based on morphological traits and sequence analyses of the internal transcribed spacer (ITS) regions of ribosomal DNA (rDNA) and the partial coding sequences of the histone 3 gene, 227 (83.5 %) isolates were identified as belonging to Alternaria tenuissima, the remainder 45 isolates were grouped to A. alternata (16.5 %). Compared with the ITS regions of rDNA, sequence analyses of the partial coding sequences of histone 3 gene displayed a critical role in discrimination of the small-spored Alternaria species. Phylogenetic analysis of the partial coding sequence of histone 3 gene clearly divided the representative Alternaria isolates into two main clades, A. tenuissima and A. alternata. The pathogenicity of A. tenuissima and A. alternata on detached leaves of sunflower cv. Gankui No.2 did not significantly differ between the two species or among isolates from different geographical origins. Our results indicate that the population structure of Alternaria species associated with sunflower leaf blight differed from that reported previously in China since A. helianthi was not found in this study. In addition, this is the first report about A. tenuissima causing leaf blight on sunflower in China. This work was supported by Program for Changjiang Scholars and Innovative Research Team in University (No. IRT1042). Mention of trade names or commercial products in this report is solely for the purpose of providing specific information and does not imply recommendation or endorsement.